Fall Fantasia 7 - Fall for Dance! Farasha & Su'ad Dance & Designs and the Mystic Moonlight Dancers are proud to present Fall Fantasia 7: Fall for Dance, featuring a workshop with the fabulous Su'ad plus an evening of wonderful Halfla performances. The event will benefit the Laurelton Fire Company # 1 Ladies Auxiliary. From noon to 1:30 p.m. Su'ad will be teaching Staging for One or Many, a wonderful choreography that shows how creative staging can take a simple pattern and breathe new life into it. Su'ad's workshop will be followed by our annual Fall Fantasia hafla - the perfect antidote to a cold autumn day! Join us for an afternoon and evening of fabulous dance fun! 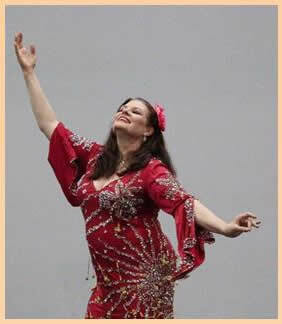 The Fall Fantasia hafla will feature dance troupes and soloists, and delicious refreshments. Enjoy the dancing and shopping with your favorite bellydance vendors! Want to be a part of this exciting show? Contact Farasha (Marisa Pierson) now to hold your dance spot!